Looking for a comfortable and potent commuter that doubles as an urban legend? Check out the 2016 Chrysler 300. An immediate hit with both the automotive media and virtually every owner since its debut for the 2005 model year, this 5-passenger full-size 4-door has the looks and content to challenge the way folks think about the family car, and the upcoming year’s trim includes a new addition that celebrates the automaker’s ninetieth year in business. Expect the 2016 300 trim lineup to once again start with the entry-level Limited, now joined by the brand new Limited Anniversary (adding features such as distinctive cabin appointments and badges, a panoramic sunroof, and upgraded technology). Next up is the sporty 300S, followed by the 300C and the top-shelf 300C Platinum. All trims offer standard rear-wheel drive (RWD), with full-time all-wheel drive (AWD) optional. Unfortunately, the truly awe-inspiring 300 SRT8 was dropped after the 2014 model year, though rumors have surfaced that a reworked 300 SRT equipped with a 500-hp 6.4-liter Hemi V8 will make an appearance in the near future. In any case, the 300’s comfy and roomy cabin is again complemented by some 16.3 cubic feet of cargo capacity in the trunk. One of the few complaints about this sedan has to do with its intrusive wheel-wells, which obstruct trunk space, which is only average in comparison to its rivals. Where the 2016 Chrysler 300 lineup again stands apart from such challengers as the Buick LaCrosse, Toyota Avalon, Kia Credenza, and Hyundai Azera, not to mention Hyundai’s less expensive Genesis, is in its abundance of standard appearance features and creature comforts. Depending on the version selected, expect 17-, 19-, and 20-inch alloy wheels, a panoramic sunroof, heated power-adjustable outside mirrors (with a driver-side auto-dimming function in higher trims), LED taillights, and acres of exterior chrome. The upcoming year’s versions also include a couple of slight tweaks to the front fascia and exterior lighting arrangement. Inside, look for leather upholstery, keyless entry and ignition, heated power-adjustable front seats, cruise control, telescoping tilt-wheel steering, and 3-zone automatic climate control. Higher trims feature a rear-view camera, remote engine start, memory for driver settings, GPS navigation, heated rear seats, and power-adjustable pedals. The Limited trim includes basic Uconnect infotainment with an 8.4-inch display, upgraded in higher trims. Reviewers are quick to point out that the Uconnect technology is about the best in the business, offering large buttons, a workable menu, and sharp graphics that put even the better Euro systems to shame. Entertainment features start with a base standard CD/MP3 player with 6 speakers, satellite radio, and an auxiliary audio input. The Anniversary includes a 6-speaker Alpine premium system with HD radio, and the 300S and above feature a Beats 552-watt 10-speaker setup. There's also a 900-watt Harman Kardon system that boasts 19 premium speakers, optional in the 300C and 300C Platinum editions. Standard power for all 2016 300 variants is a 3.6-liter V6 engine mated to an 8-speed shiftable automatic transmission. Look for all trims other than the 300S to produce 292 hp and 260 lb-ft of torque--the 300S uses the same V6 to produce 300 hp and 264 lb-ft of torque. Additionally, the 2016 300S returns with steering-wheel-mounted paddle shifters, a sport-tuned suspension, and performance tires, along with the standard sport exhaust system. Mileage estimates return at 19 mpg city/31 highway/23 combined in FWD versions, and 18/27/21 in trims with AWD. Need more grunt? Look for all trims except the Limited to remain eligible for a potent 5.7-liter Hemi V8 that again mates with the 8-speed shiftable automatic for 363 hp and 394 lb-ft of torque. Offered only with RWD, the V8 has mileage estimates of 16/25/19. Standard safety equipment aboard all 2016 Chrysler 300 iterations includes 4-wheel antilock brakes, traction and stability control, front side-mounted airbags, front and rear head-protection airbags, a driver’s knee airbag, daytime running lights, a post-collision safety system, and a remote antitheft alarm. All trims other than the Limited boast standard front fog/driving lights, and are eligible for SafetyTec 1 and SafetyTec 2 packages that feature such upgrades as front and rear parking sensors, blind-spot monitoring, rear cross-traffic alerts, automatic wipers, lane-departure warnings, and auto high-low-beam high-intensity-discharge (HID) headlights. 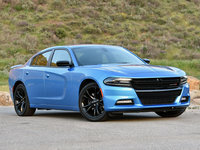 Though government safety testing data for this hefty Chrysler sedan is unavailable, the Insurance Institute for Highway Safety (IIHS) gives the current 300 its highest score of Good in all safety tests except the small-overlap frontal-offset test, where it earned a next-to-worst score of Marginal. 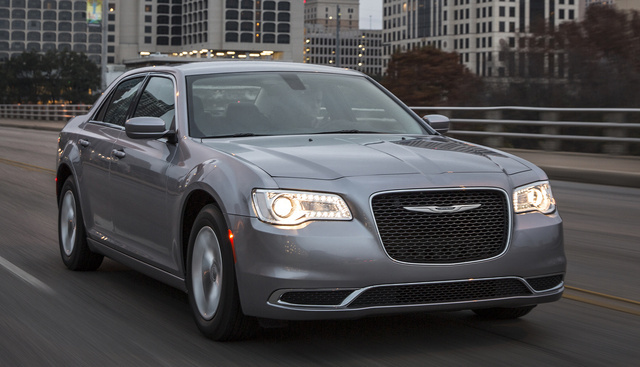 What's your take on the 2016 Chrysler 300? GuruWG48X very nice vehicle, 300 anniv model !! drives supurb and is very comfortable as well !! nice sound pkg, and the great look of the 300 style !!! very happy !!! Have you driven a 2016 Chrysler 300?